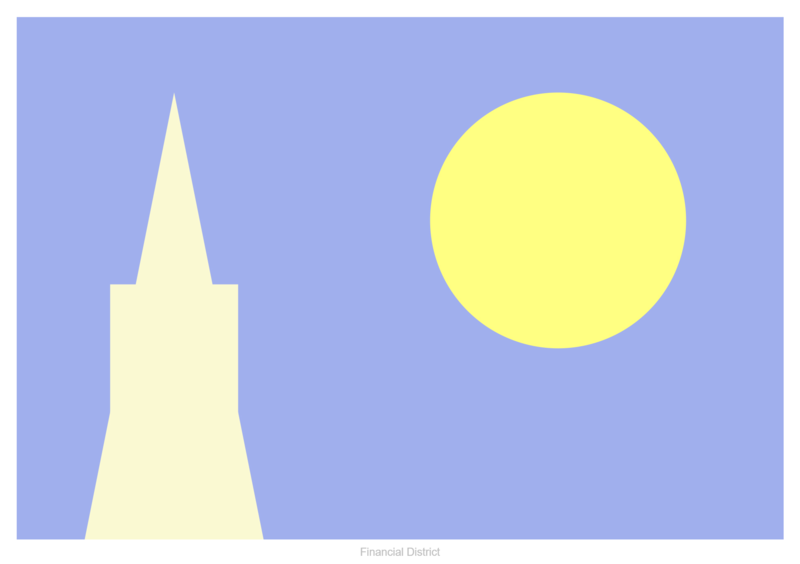 Experimenting with composition, palette and ratios, I visualized San Francisco's historical icons in the most minimalist way. 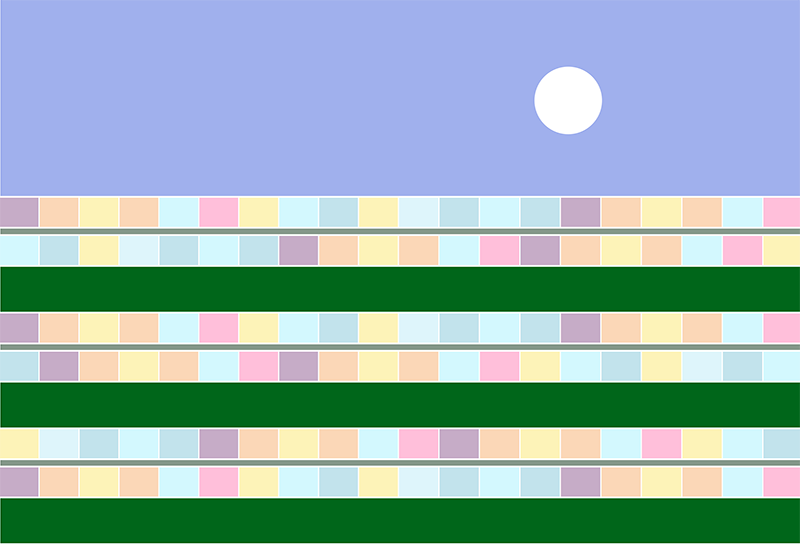 The final compositions are simple web pages that contain less than 20 lines of computer code. The challenge has been to capture these iconic scenes as detailed and as lean as possible. Painting is like design, its engineering. When presented a problem, you solve it. 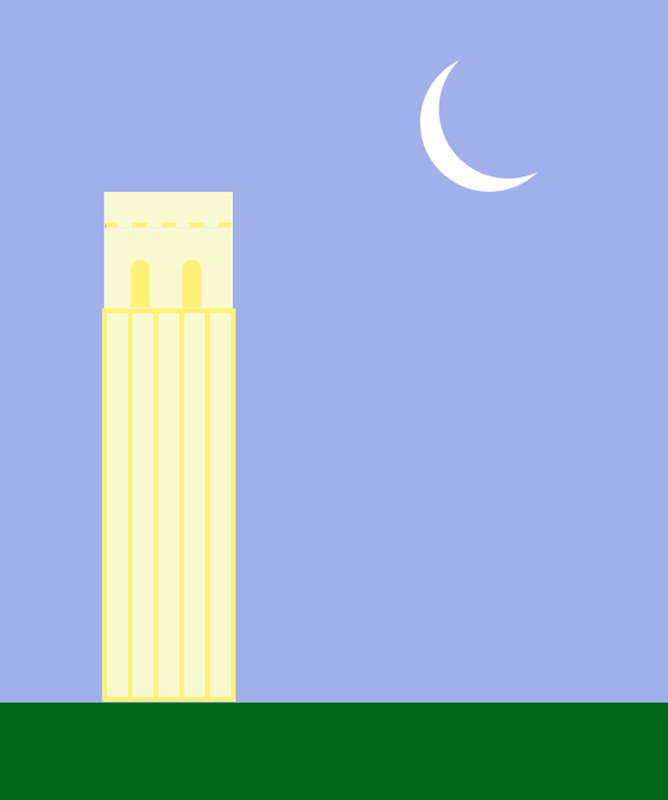 I feel I did that here. First in the "Ocean Beach Series". 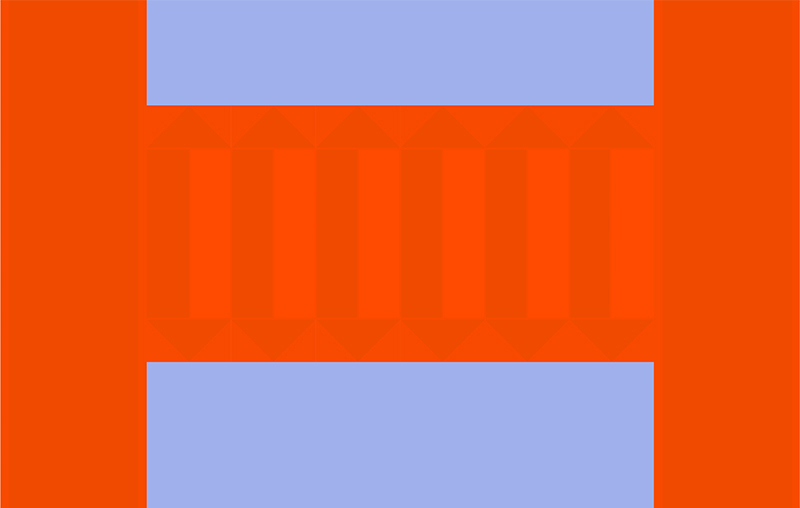 Experimenting with composition, palette and ratio's, I visualized San Francisco's Ocean Beach in the most minimalist way. 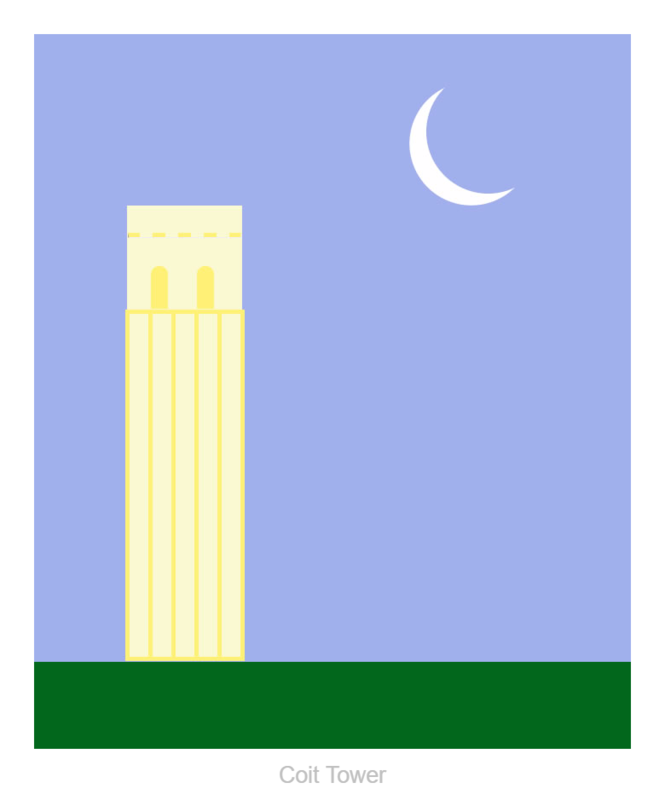 Ratio's dictate that there is more sky than earth, more water than land. 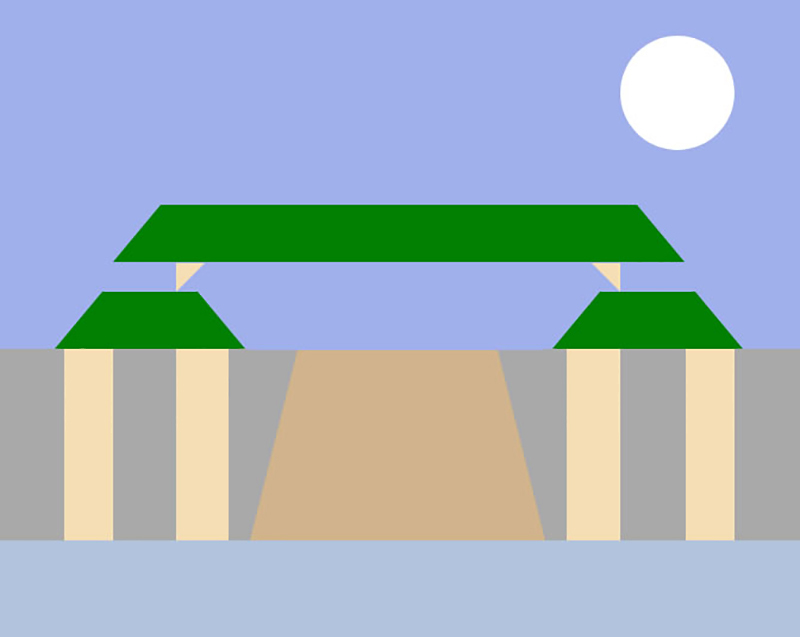 The 4 elements, Sky, Ocean, Waves and Beach, colors, are very specific. The color of Earth is the sum of sand, vegetation and foliage that you would see on Ocean Beach. Adding to the "Ocean Beach Series". 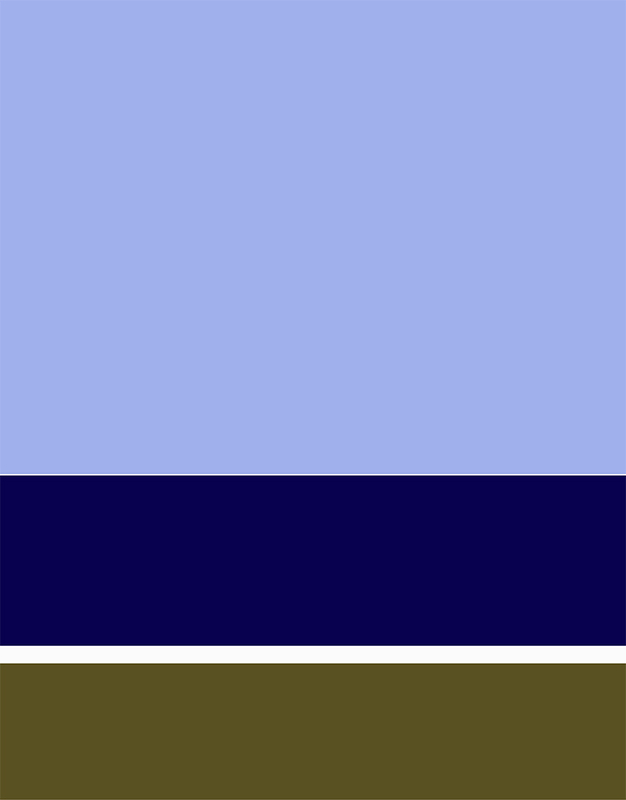 Experimenting with composition, palette and ratio's, I visualized San Francisco's Ocean Beach in the most minimalist way. Ratio's dictate that there is more sky than earth, more water than land. The 4 elements, Sky, Ocean, Waves and Beach, colors, are very specific. The color of Earth is the sum of sand, vegetation and foliage that you would see on Ocean Beach. The 3 panels represent the Sun setting, the original beach and a view of the Farallones, a real Sunset Kid special! 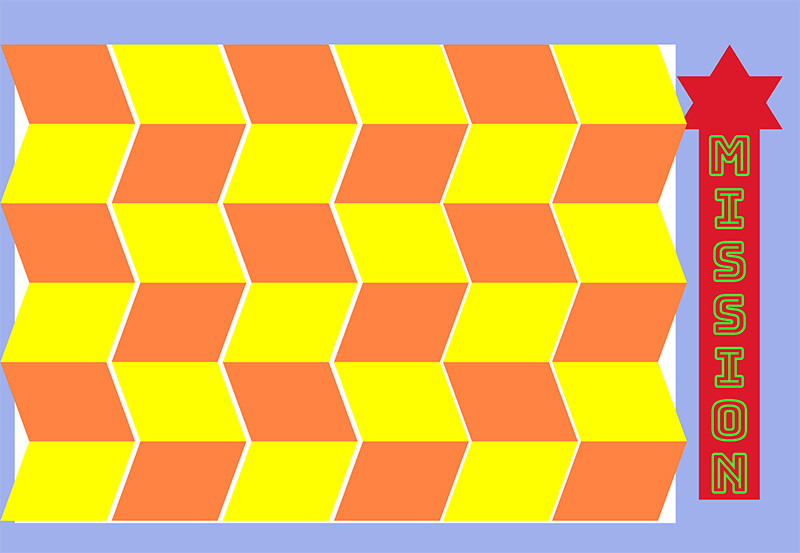 View each panel, left, center, right. 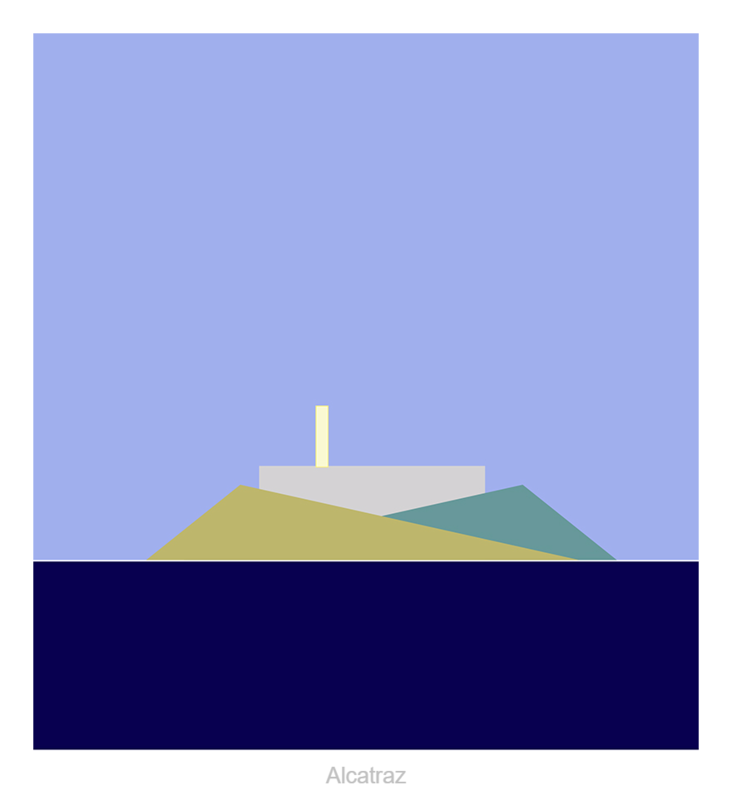 Again, experimenting with composition, palette and ratio's, I continue my "Ocean Beach Series" with a minimalist version of Alcatraz Island. I have swam to and from Alcatraz many times, and this is the view a swimmer would see. Yes, its possible! The original is a HTML page (here). 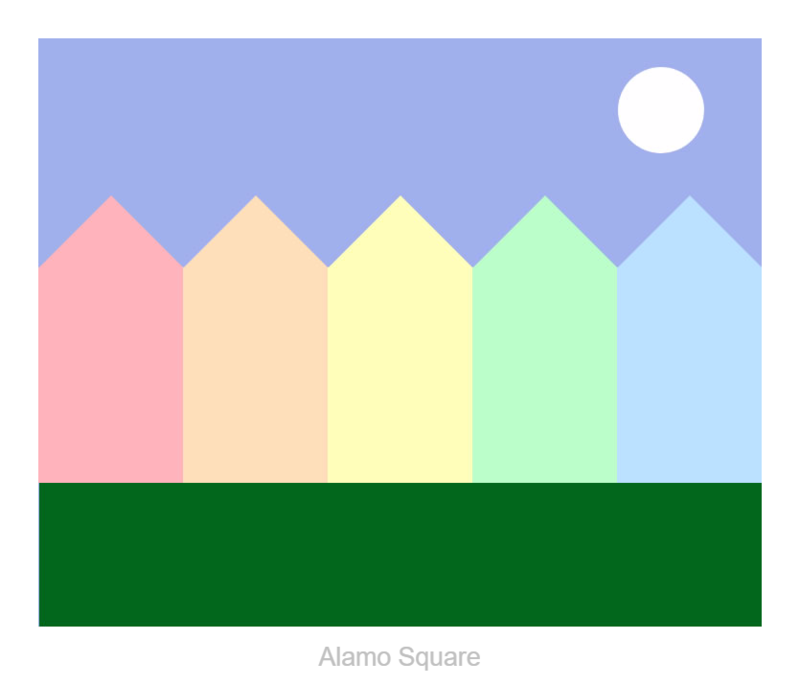 Again, experimenting with composition, palette and ratio's, I continue my "Ocean Beach Series" with a minimalist version of Alamo Square and the 'Painted Ladies" Victorian homes. 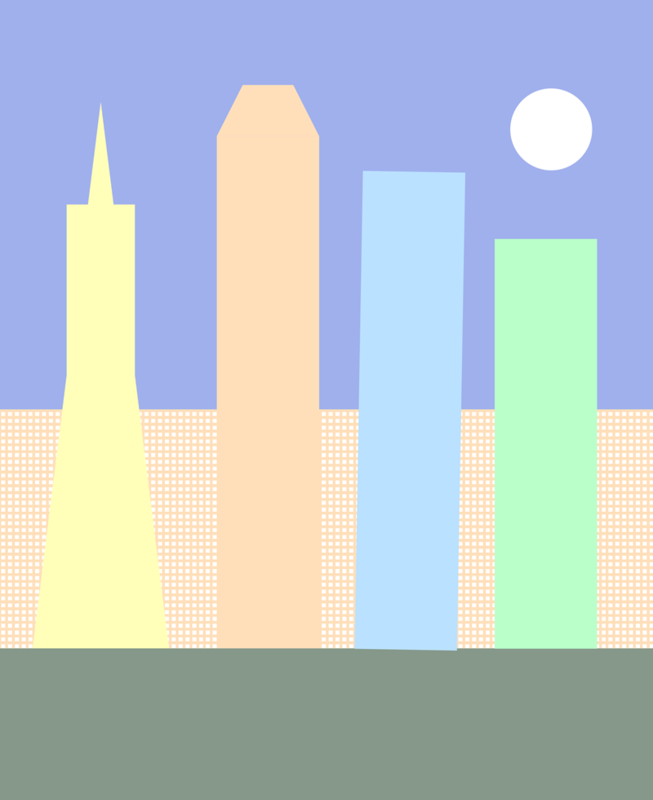 Experimenting with composition, palette and ratio's, I continue my "Ocean Beach Series" with a minimalist version of downtown San Francisco and its iconic Pyramid, and yes, the Millenium Tower is tilting one degree!! 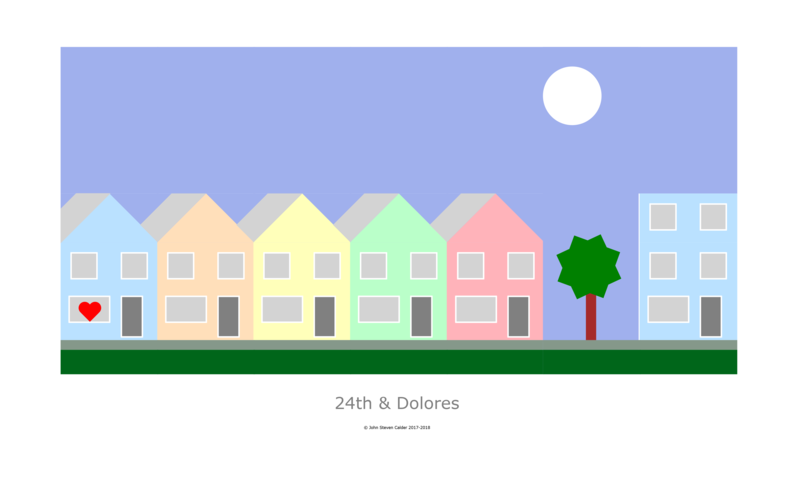 I continue my "Ocean Beach Series" with a minimalist version of Dolores Street in the Mission. In fact, "Home is where the Heart is"! 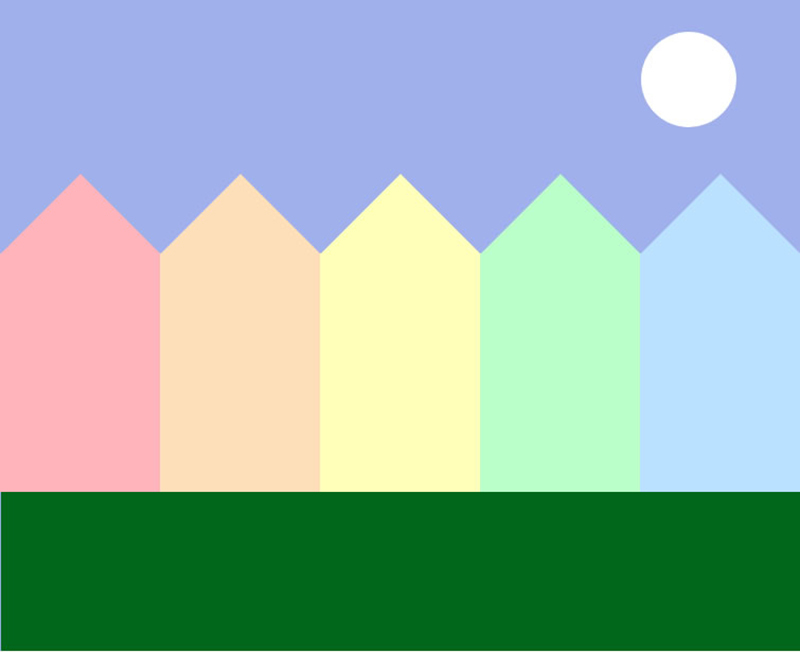 ..my childrens family home. 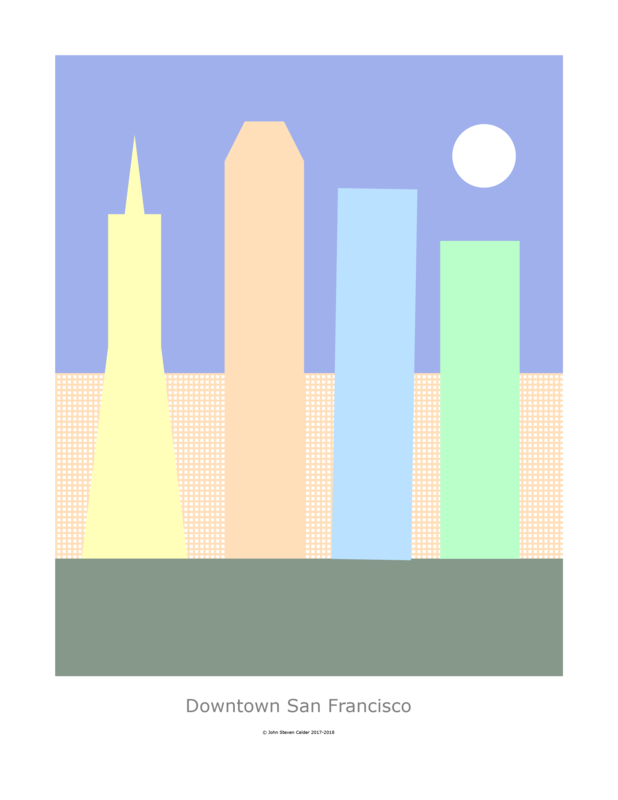 I continue my "Ocean Beach Series" with a minimalist version of the Mission District, representing New Tech pushing out Old School. 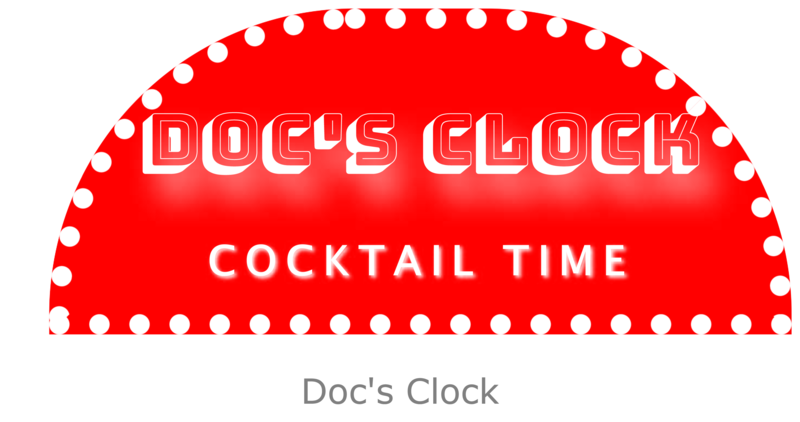 This is new condo project across from Docs's Clock. Mango Orange anyone? 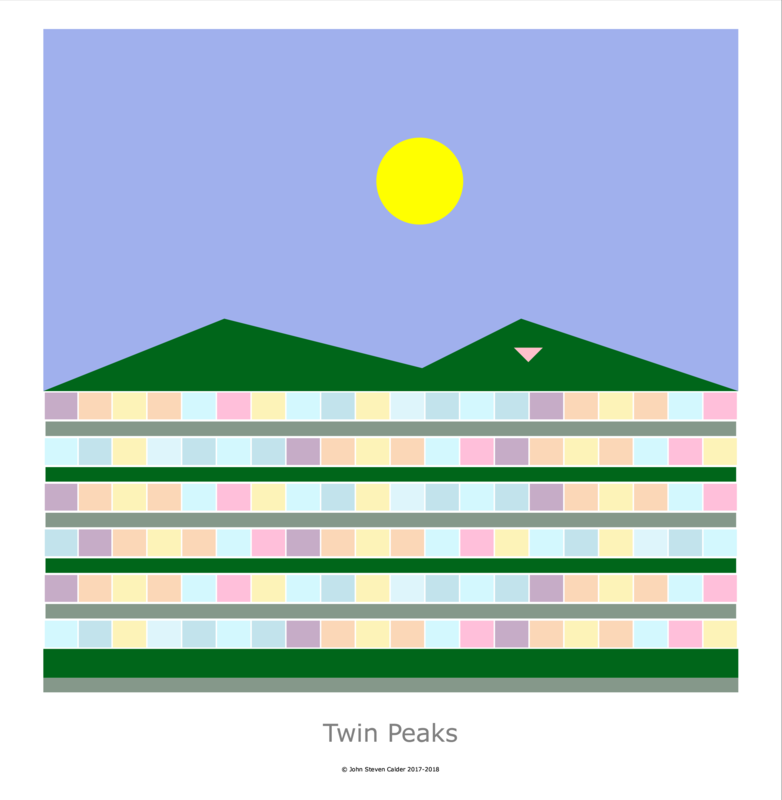 Experimenting with composition, palette and ratio's, I continue my "Ocean Beach Series" with a minimalist version of our iconic Twu=oin Peaks (named Noe and Eureka to locals). 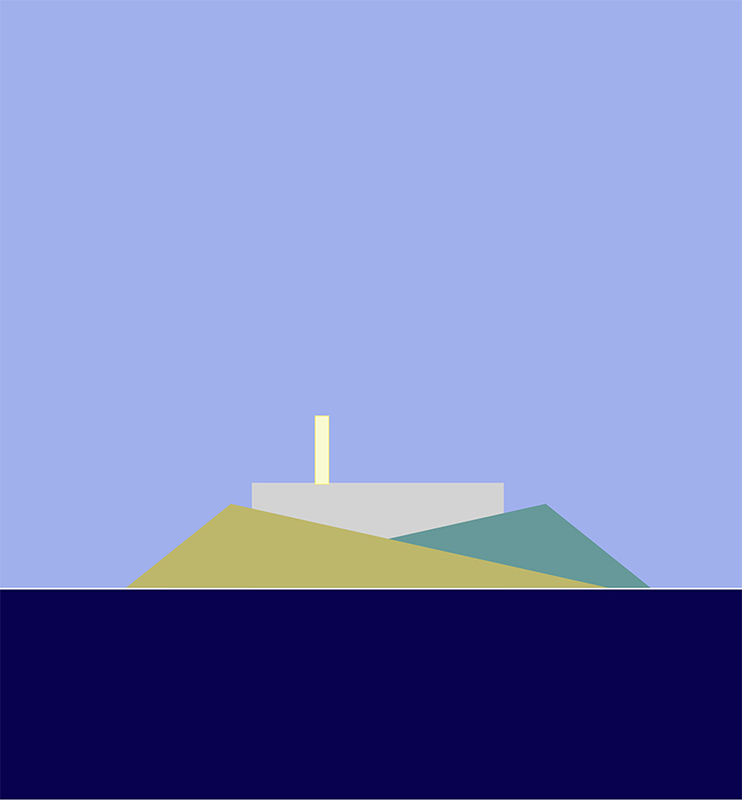 Again, experimenting with composition, palette and ratio's, I continue my "Ocean Beach Series" with a minimalist version of our iconic San Francisco's pyramid. 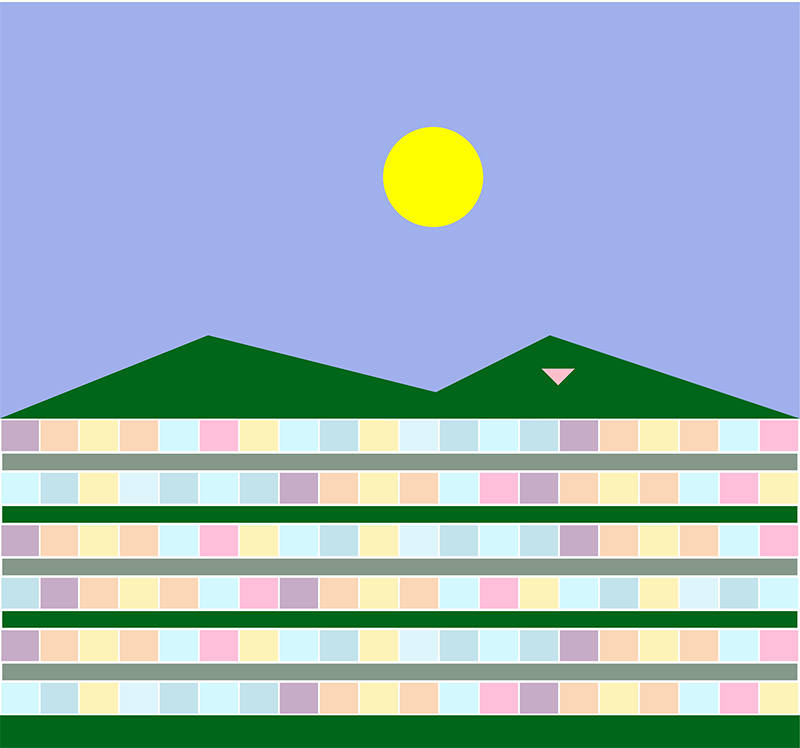 Again, experimenting with composition, palette and ratio's, I continue my "Ocean Beach Series" with a minimalist version of Daly City and its iconic 'little boxes' housing. 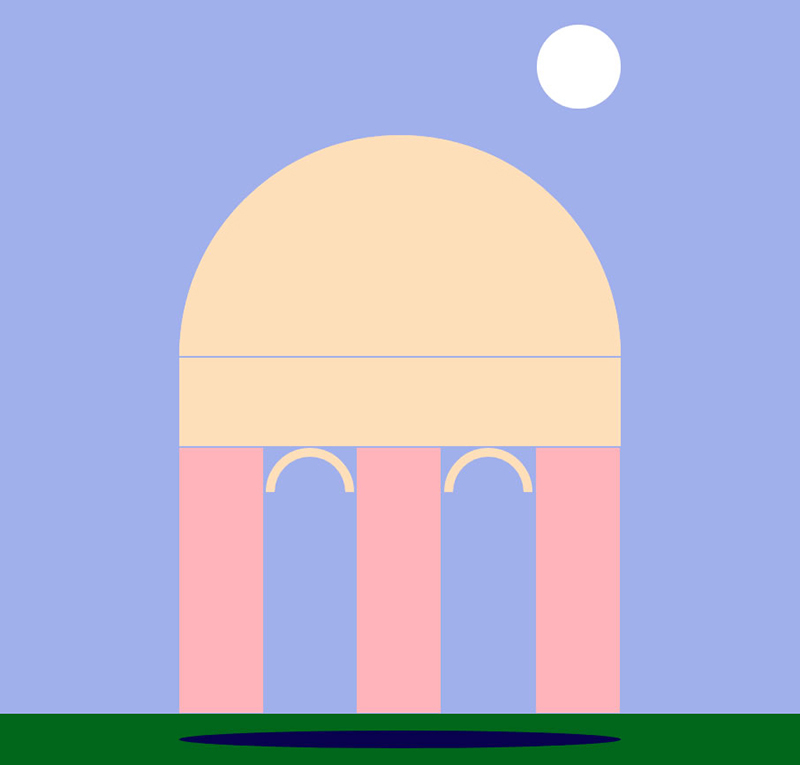 Again, experimenting with composition, palette and ratio's, I continue my "Ocean Beach Series" with a minimalist version of our iconic San Francisco's City Hall. 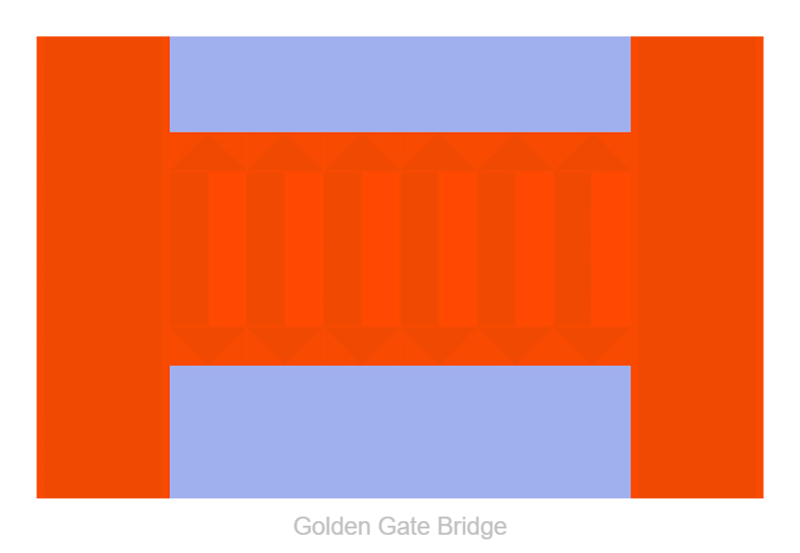 Again, experimenting with composition, palette and ratio's, I continue my "Ocean Beach Series" with a minimalist version of our San Francisco's iconic Golden Gate Bride and its Art Deco features. 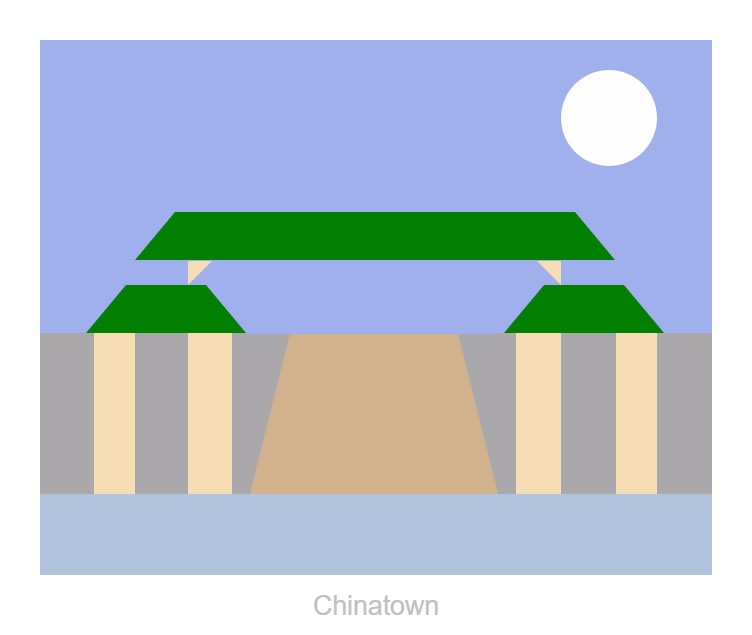 Again, experimenting with composition, palette and ratio's, I continue my "Ocean Beach Series" with a minimalist version of our iconic San Francisco's Chinatown Gates. 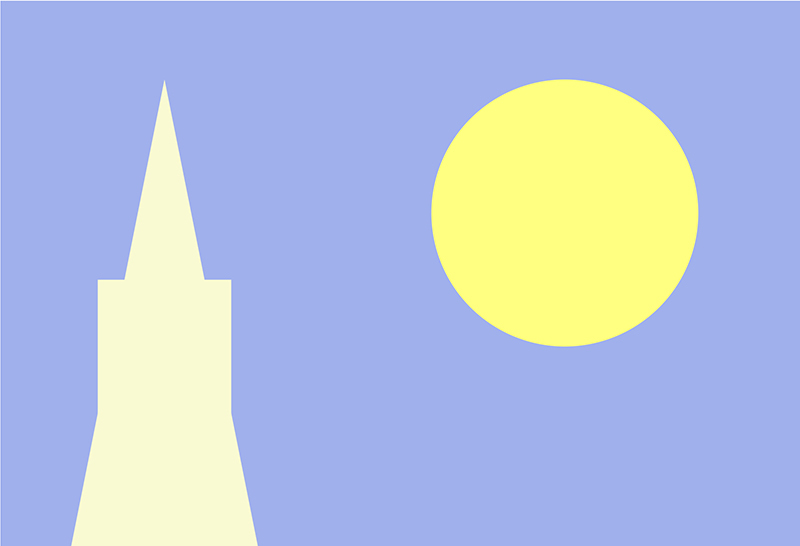 Again, experimenting with composition, palette and ratio's, I continue my "Ocean Beach Series" with a minimalist version of our San Francisco's iconic Coit Tower. 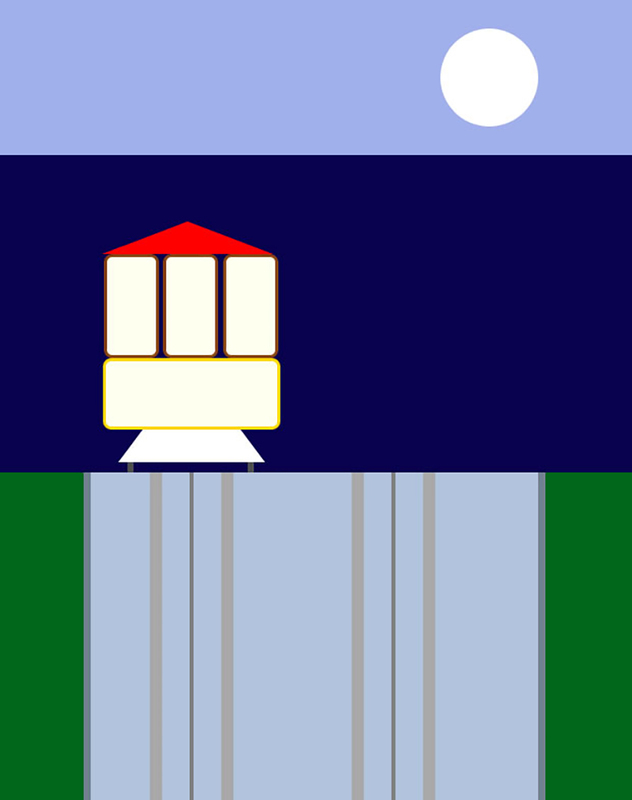 Again, experimenting with composition, palette and ratio's, I continue my "Ocean Beach Series" with a minimalist version of our iconic San Francisco's Cable Cars. 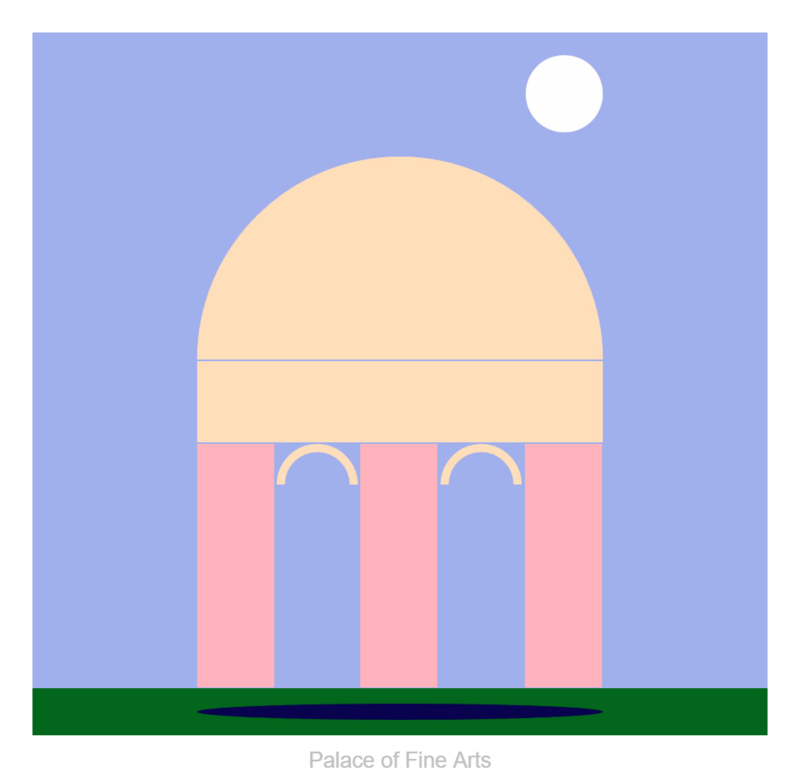 Again, experimenting with composition, palette and ratio's, I continue my "Ocean Beach Series" with a minimalist version of our iconic Worlds Fairs structure. 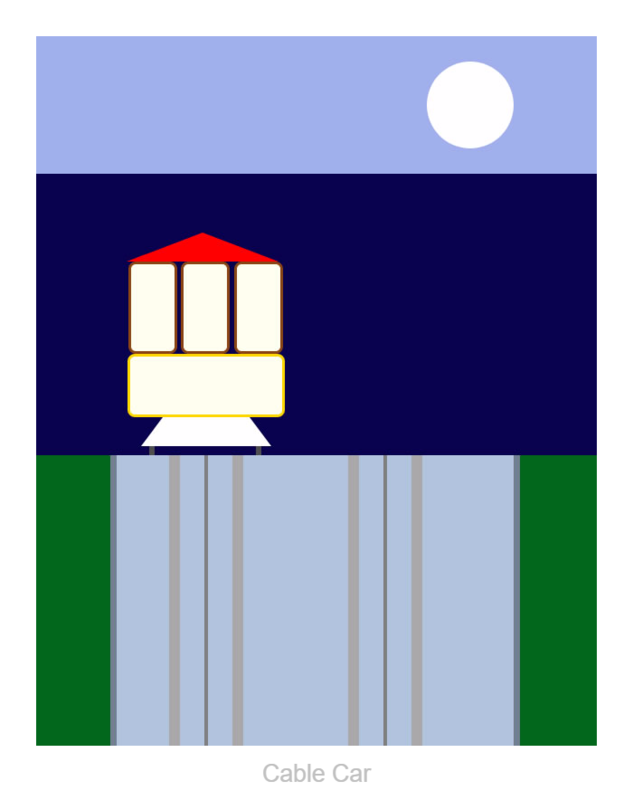 Again, experimenting with composition, palette and ratio's, I continue my "Ocean Beach Series" with a minimalist version of my favorite local watering hole.